Traffic jam is one of the most irritating problems in Bangladesh. No one seems to be doing anything about this unfortunate situation. Traffic jam has a number of negative effects: wasting time of motorists and passengers, delays, inability to forecast travel time accurately, wasted fuel, increasing air pollution and carbon dioxide emissions and wear and tear of vehicles. What would happen if people used bicycles instead? Would it reduce traffic jams? I think it would. Bicycles were introduced in the 19th century and now it numbers about one billion worldwide. Therefore there are twice as many bicycles as other automobiles. They provide a popular form of recreation, and have been adapted for such uses as children's toys, adult fitness equipment, military and police use, courier services and bicycle racing. 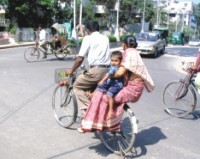 A person travelling on a bicycle at low to medium speeds of around 1015 mph (1525 km/h) uses only the energy required to walk. Recently, several European cities and Montreal have implemented successful schemes known as community bicycle programmes or bike-sharing. These initiatives complement a city's public transport system and offer an alternative to motorised traffic, to help reduce congestion and pollution. In Europe, especially in the Netherlands and parts of Germany and Denmark, commuting by bicycle is very common. So, bicycle should be made popular in our cities to reduce traffic jam. In Bangladesh, the mobile phone operators with their ceaseless efforts are toiling to bring the people under the umbrella of advanced communication technology. Along with the mobile phone operators, the world's top class cellular phone manufacturers, providing latest features through their products have successfully been able to create a niche market in Bangladesh. But according to the news, the markets have outrageously been overstocked with fake cellular phones! A group of importers are involved in bringing fake phones to Bangladesh from China and other countries where the products of some leading mobile phone companies are manufactured. Since these devices are packed with many lucrative features and come in cheap prices and have fake warranty cards, many people are willing to purchase them. However, within a few months, these counterfeit phones begin to come apart. What is more upsetting is that not only are people being duped, but the government is also losing huge revenue and taxes on these items. The IMEI (International Mobile Equipment Identity) numbers glued to these cellular phones, which are used to prevent from the theft and mugging, are also fake. As a result, the consumers are also deprived of hi-tech security. It is, thus, well expected from the BTRC to keep a lookout for these corrupt importers to secure the rights of consumers and the revenue of the government. The Ministry of Communication and nepotism are deemed today as synonymous. They have already created a reputation of talking a lot rather than executing any project. Now they are the talk of the town with regard to the fracture repair of the Bangabandhu Multipurpose Bridge. It was recently published in a daily newspaper that, corruption is taking place in the Bangabandhu bridge repairing issue. A Chinese company has been hired to repair the bridge for BDT 243 crore, but they do not have any prior experience in this type of work. It is not clear to us why the ministry made this decision and handed over the repair of one of our most important bridges to an inexperienced company. The guess is that someone in a powerful position has handled this matter inefficiently. Allegations of corruption are being made against this ministry. This seems to happen quite often in our country. 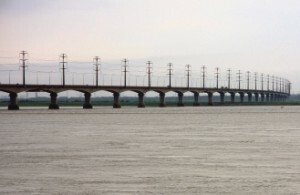 There is a timeframe to complete construction work of the Padma Bridge within Awami League's tenure but work is yet to start, though two and half years have already passed. 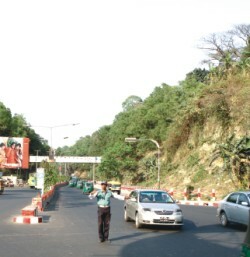 There were similar allegations made with regard to the Chittagong highway project. The repair of the Bangabandhu Bridge does not seem to be a priority. The government should get to work unless they want to lose votes in the next election. It is a matter of great regret that our town planners have always failed to see the problems of the common people. It's been a regular happening in our beloved city Chittagong that every year when the monsoon approaches, they unnecessarily start to excavate major roads, streets and sometimes a very narrow streets. We don't know if it is part of a development project or even just regular upkeep, but we wonder why it has to start right before the rainy seasons or right in the middle of monsoon? Can they not plan it when it's dry and more convenient for everyone? Not only have these untimely excavations increased our miseries, but the authorities too face a lot of problems while completing the task. It simply doesn't make any sense. The completion of the task takes twice or even three times more time and effort than usual just because of the incessant rain and stagnant water. People of all ages suffer greatly because of this, and it will not be an exaggeration to say that the authorities squander huge government funds behind these half done projects. I'm an inhabitant of the Halishahar area and I have been experiencing this problem since my childhood. Can the government find a solution, please?